Spring in Guyuan has been accompanied by warm afternoons, soothing sun, clouds of sand and plenty of wind. The wind usually manifests itself by sweeping through the streets with purpose, whipping around corners and depositing dust on every surface. However dust isn’t the only thing its deposits - and it took me a while to figure that out. Most mornings I leave the house fairly early - going out to grab a baggie of baozi or a few bingzi for breakfast - and walk though my enclosed courtyard to my rather imposing front metal gate. A 10-foot brick wall fronts my small alley, broken only by the solid red metal double-doors, and a slightly shorter wall separates me from my rather distinguished neighbors, the former and present school headmasters. This leaves the courtyard fairly isolated. But not isolated enough it seems. 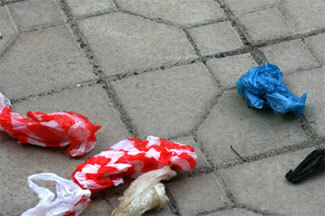 Each morning I find a small flotilla of plastic bags fluttering and slowly swishing around the gray concrete tiles. Blue, red, candy-striped. Sometimes small and torn, open like a miniature parachutes, other times tightly balled and rolling around in lazy circles. At first I would grit my teeth and pick them up, imagining, as I walked to the garbage heap, my neighbors rigging up complex trash-flinging contraptions. I chalked it up to some unknown cultural activity of tossing used plastic bags over the brick wall. Let the foreigner deal with the plastic bags. I nursed this idea for the past week or so, until this morning. With a small bag of breakfast in my hand I walked through the courtyard - ignoring the new arrivals on the ground - but stopped in my tracks when something caught my eye. There in the sky was a bag riding some low-level Guyuan jet-stream. Not just one bag but a squadron of bags, winging overhead, strafing the town. Then, if as on cue, two bags peeled off from the group. I could almost hear the soundtrack of some Zero attack over the Pacific, whining engines, anti-aircraft fire. But here was no waffling in their route, it lead straight to my small courtyard. So much for rude neighbors cluttering my yard - I can blame it on the jet-stream.